My curiosity peaked a few weeks ago when an interesting email appeared in my inbox. Do you want to come to an event being organised by The Chartered Institute of Patent Attorneys (CIPA)? And by the way, would you like to speak as well on how artificial intelligence (AI) will affect your job? 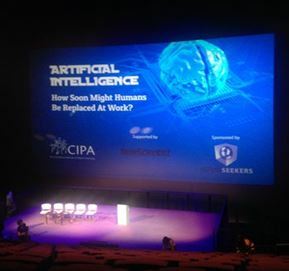 What started out as a small gathering at CIPA turned into a full scale debate in the IMAX theatre in the Science Museum on 2 November. There was an audience of around 200. 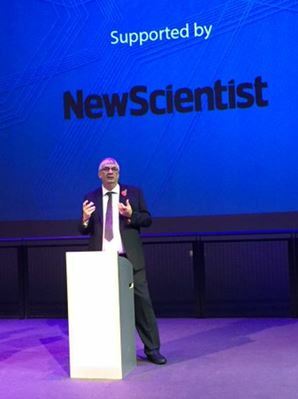 Tom Clarke, Channel 4 Science Correspondent, was at the helm as moderator. Myself and Ilya Kazi, Mathys and Squire, argued against Callum Chace an AI author and Chrissie Lightfoot, The Naked Lawyer. Fast forward to seven o'clock on Monday. A clip from the recent TV series Humans is playing on the IMAX screen, which is enormous when you stand next to it as we file up the stairs to the stage to face the audience. Callum goes first and talks about how AI has improved and is growing exponentially. Illustrating his point he talks about how if you put a drop of water into a football stadium and two the next day and keep doubling each day afterwards it looks a bit soggy on day 27 and you drown on day 28. I not sure what this has to do with patents but it is soon my turn. That's me taking centre stage. I start by pointing out just what an examiner does before moving onto what any software would need to do. I even concede that AI might help me search applications but I’m not sure we would really trust it. I talk about what the software needs to do, pointing out that it would need to handle 93 pages of the Act, 70 Pages of Rules and 880 pages of the manual. I then delve into the murky world of claim language pointing out that applicants might actually have something new and that it might not be in the training data. I finally finish on public trust issues and whether the public would trust the software used or would prefer an examiner. Chrissie’s next up and talks about how AI is already helping law firms prepare for cases and in discovery. She also talks about how AI is changing practice in law firms and they now actively use it as a tool for attracting clients. Then it’s the turn of the audience. We get a question along the line of “If legislation is a problem why not get AI to write it for you”, I'm not sure whether the government is up for that. Another asks about the AI singularity predicted for 2029 but Ilya points out that since IP moves at glacial speed this might not be a problem. All seems to be going well and we start to think we might actually win until an attorney points out that the proposal says only “a patent” and he is convinced somewhere in the world that will happen. We then have the vote and we lose 80-60 (not everyone appeared to vote) but we feel that we have won the moral argument. So that was that. I headed off into the night to ponder the evening’s event and look for a libation or two. Still, for me walking through the space hall on my own with nobody else around was a highlight of the evening and reminded me that I first came here nearly 40 years ago. Would I do it again? Yes it was a fantastic experience. However next time could we have some dry ice and loud music as we walk up the stairs? I think your curiosity was piqued -- or perhaps it peaked -- but there was definitely no peeking!